Identification: Moyle (1976); Hubbs et al. (1991); Page and Burr (1991); Etnier and Starnes (1993); Jenkins and Burkhead (1994). 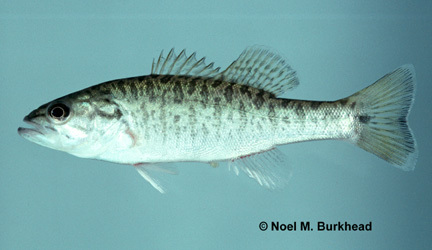 This species was formerly composed of three subspecies: the northern Spotted Bass (M. p. punctulatus), the Alabama Spotted Bass (M. p. henshalli) and the Wichita Spotted Bass (M. p. wichitae). Cofer (1995) determined the Wichita subspecies was actually a hybrid with M. dolomieu and is therefore invalid. Native Range: Mississippi River basin from southern Ohio and West Virginia to southeastern Kansas, and south to the Gulf; Gulf Slope drainages from the Chattahoochee River, Georgia (where possibly introduced), to the Guadalupe River, Texas (Page and Burr 1991). Table 1. States with nonindigenous occurrences, the earliest and latest observations in each state, and the tally and names of HUCs with observations†. Names and dates are hyperlinked to their relevant specimen records. The list of references for all nonindigenous occurrences of Micropterus punctulatus are found here. Means of Introduction: Intentional stocking for sportfishing. In Missouri, the Spotted Bass was stocked in the Sac River and spread downstream through the Osage River into the Missouri River (MacCrimmon and Robbins 1975). Status: Established in most locations. Probably not established in Colorado. Impact of Introduction: The Spotted Bass hybridizes with the smallmouth bass when stocked in the smallmouth bass's native range or when both species are stocked in the same area. Spotted Bass introduced into central Missouri have hybridized with the native smallmouth bass M. dolomieu (Pflieger and Fajen 1970; Pflieger 1975, 1997; Whitmore 1983). Reportedly, the decline of smallmouth populations in the Moreau drainage in Missouri is at least partly attributable to hybridization with introduced Spotted Bass (Pflieger 1997). The hybrid has been also been found in the Verde River, Arizona (Minckley 1973); California (Moyle 1976); and the Marmaton River, Barbour County, Kansas (Cross 1967; museum specimen KU 4682). The form formerly believed to be the subspecies M. p. wichitae from southwest Oklahoma was determined to be this hybrid (Cofer 1995). Sammons (2012) found significant overlap in diets between juvenile and subadult Spotted Bass and juveniles and subadults of both largemouth (M. salmoides) and shoal (M. cataractae) bass, indicating the potential for trophic competition. Introduced predatory centrarchids are likely responsible for the decline of native ranid frogs in California and for the decline of California tiger salamander Ambystoma californiense populations (Hayes and Jennings 1986; Dill and Cordone 1997). Remarks: Introduced bass likely affect populations of small fishes through predation. Two subspecies have been transplanted: M. p. punctulatus in Alabama (Lee et al. 1980 et seq. ), California (Dill and Cordone 1997), Florida, Georgia (Lee et al. 1980 et seq. ), Kansas (Cross and Collins 1995), Kentucky (Burr and Warren 1986), North Carolina (Lee et al. 1980 et seq. ), Texas (Hubbs 1954), Virginia (Lee et al. 1980 et seq. ; Jenkins and Burkhead 1994) and probably West Virginia; and M. p. henshalli in California (Lee et al. 1980 et seq. ; Dill and Cordone 1997), and the upper Chattahoochee drainage in Georgia (JDW, personal observation). Subspecies identity of other introductions is unknown. Native and introduced in the Tennessee drainage in North Carolina (Menhinick 1991). Not listed as occurring in South Carolina by Loyacano (1975) or by Rohde et al. (1994). Stauffer et al. (1995) listed this species as native but possibly introduced in the Kanawha (including the New) drainage, West Virginia. MacCrimmon and Robbins (1975) showed a map depicting this species' native and introduced range. Cofer, L.M. 1995. Invalidation of the Wichita spotted bass, Micropterus punctulatus wichitae, subspecies theory. Copeia 1995(2): 487-490. Cross, F.B. 1967. Handbook of fishes of Kansas. State Biological Survey and University of Kansas Museum of Natural History Misc Publ No 45 Topeka, KS. Hubbs, C., and A. E. Peden. 1968. Notes on the distribution of blackbass (Micropterus) in the San Marcos River, Hays County, Texas. Texas Journal of Science, 20(2): 193-194. Pflieger, W.L. 1975. The fishes of Missouri. Missouri Department of Conservation. Pflieger, W.L. and O. Fajen. 1970. Natural hybrids, smallmouth bass x spotted bass. Abstracts Fisheries Resource Reports Missouri Department of Conservation Division of Fisheries 9:37. Sammons, S.M. 2012. Diets of juvenile and sub-adult size classes of three Micropterus spp. in the Flint River, Georgia: potential for trophic competition. Southeastern Naturalist 11(3):387-404. Sigler, W.F. and J.W. Sigler. 1987. Fishes of the Great Basin: a natural history. Univerity of Nevada Press. Reno, NV. 425 pp.